Here's the latest comic for Investing.com. This week's subject is the recent talk of the UK leaving the European Union. 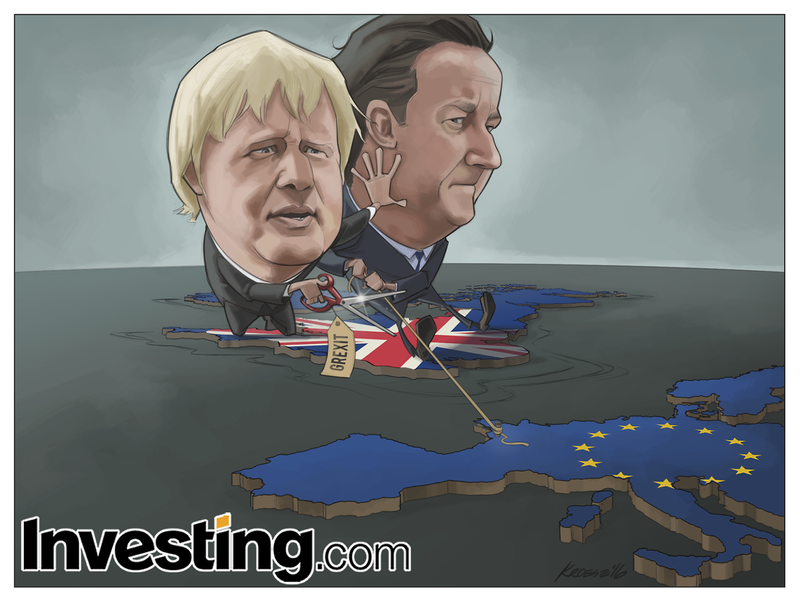 The team at Investing.com asked me to draw London Mayor Boris Johnson (who said recently he would support the UK leaving the EU) and Prime Minister David Cameron (who wants the UK to remain in the EU) standing on top of a Union Jack-colored UK as it begins to float away from Europe. 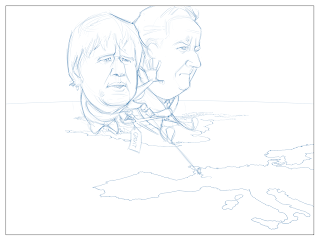 They asked me to draw Cameron holding on to a rope tied to mainland Europe while Boris Johnson puts his hand in Cameron's face and attempts to cut said rope. This comic was a tough one in terms of composition. 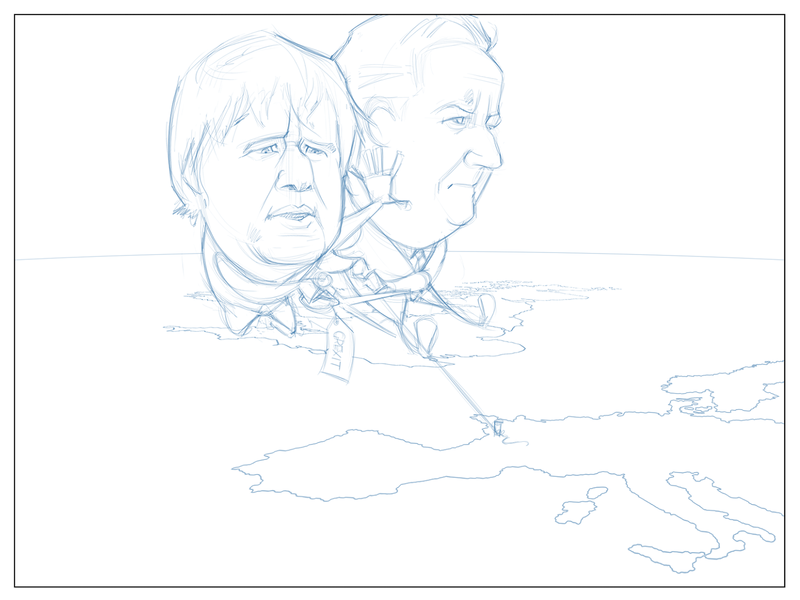 I originally wanted Cameron, Johnson, and the UK in the foreground so they'd all be bigger. But doing so would have necessitated the countries being drawn upside down. I chose to draw them all right side up for the sake of clarity, although I still had to change the perspective to make it look halfway believable. The result is some oddly-shaped countries, but I think it still conveys the message. Ok, I would reflect more, but I'm pressed for time. Overall, I think this is a decent comic. 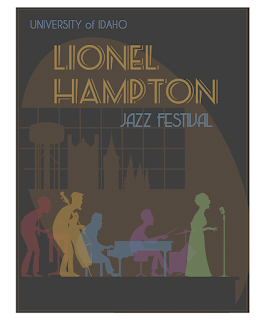 A couple months back, I was asked by some folks at the University of Idaho if I'd be interested in illustrating this year's commemorative poster for the University of Idaho Lionel Hampton Jazz Festival. 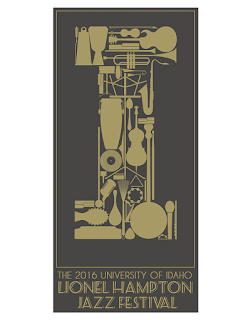 The festival, which is held every year on the University of Idaho campus, brings together students and professional jazz musicians from all over the world for a week of workshops and concerts. 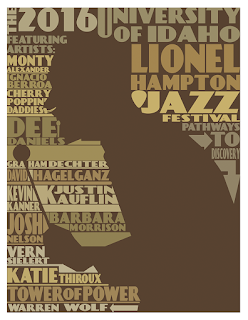 I've gone to the concerts just about every year for the last decade or so and have loved jazz (in a super-uneducated way) for much longer. So it was an honor and a thrill for me to be asked to create the commemorative poster (which is different from the advertising/informational posters in that it has a little more room to be expressive). The first thing we did was meet and talk about past posters, the theme of this year's festival, the goals of the poster, and a potpourri of other related things. They made it clear to me that, as the artist, I pretty much had carte blanche on this. So I went away and gave it some thought. 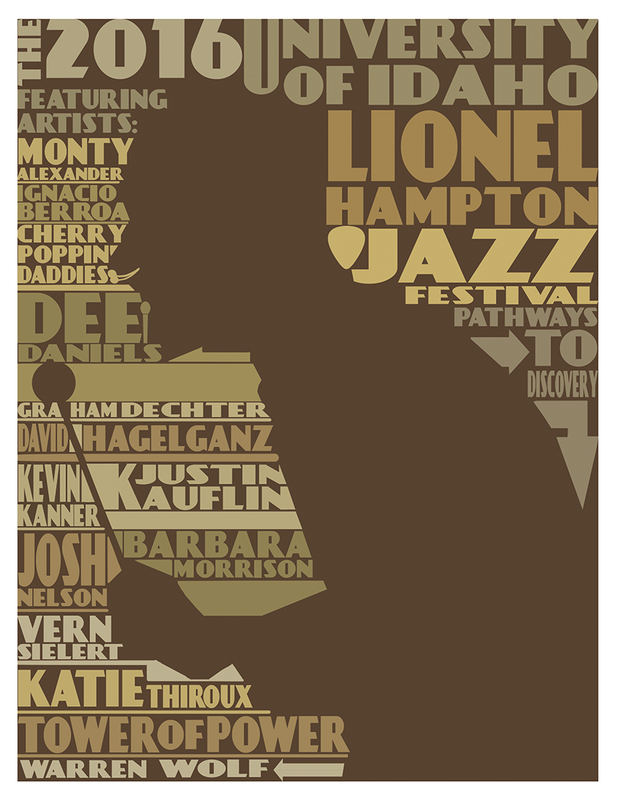 Jazz is so broad and has so many iterations, meanings, and is influential in so many ways, I figured out pretty quickly that to try to distill ALL of jazz into a single poster would be a fool's errand. 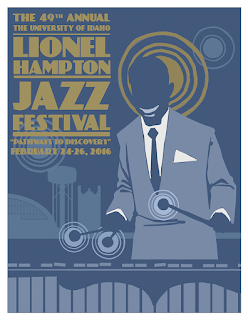 Two of the concepts (along with many of the past festival posters) focus on the festival's namesake, Lionel Hampton, who was an incredible vibraphone player and composer. 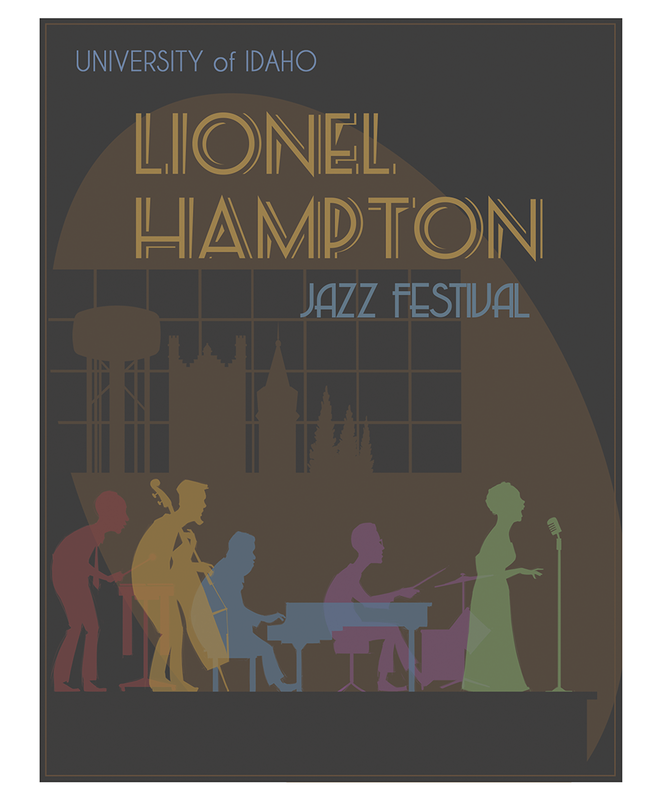 In this concept, I tried to capture some of Hamp's energetic spirit in a vintage jazz poster style. 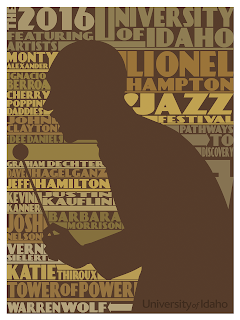 This concept focuses on some of the other titans of jazz and the profound influence they've had on the genre: Lionel Hampton, Thelonius Monk, Art Tatum, Max Roach, and Dinah Washington. There's also a wink to the UI campus in the background. This is an approach I've done several times before. 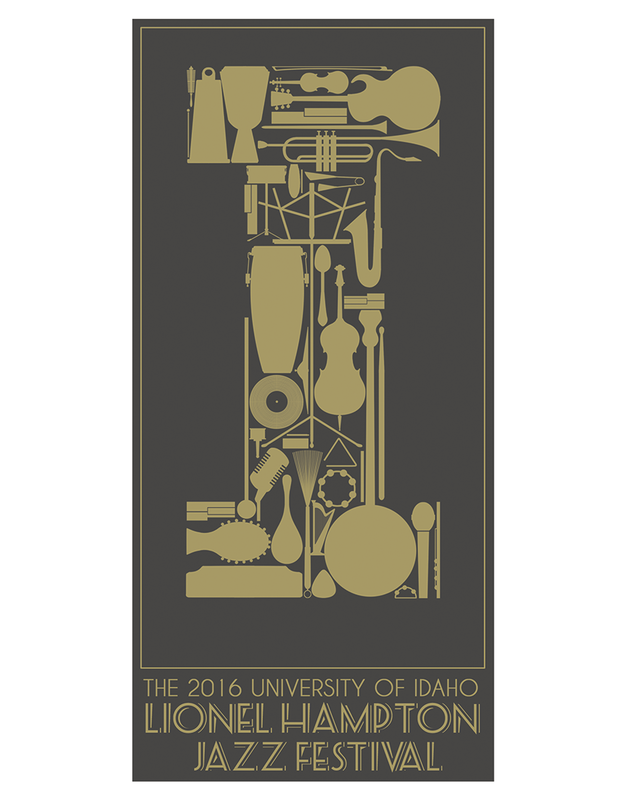 It's labor intensive, but I think it's a solid metaphor: The festival is a diverse collection of musicians and styles, brought together by the University of Idaho (that "I" is one of the main UI graphics. Finally, in a fit of inspiration (the kind that I can usually only get to once I've ruminated on a topic for weeks), I tried a slightly different version of the same "collage" idea, only this time with words. 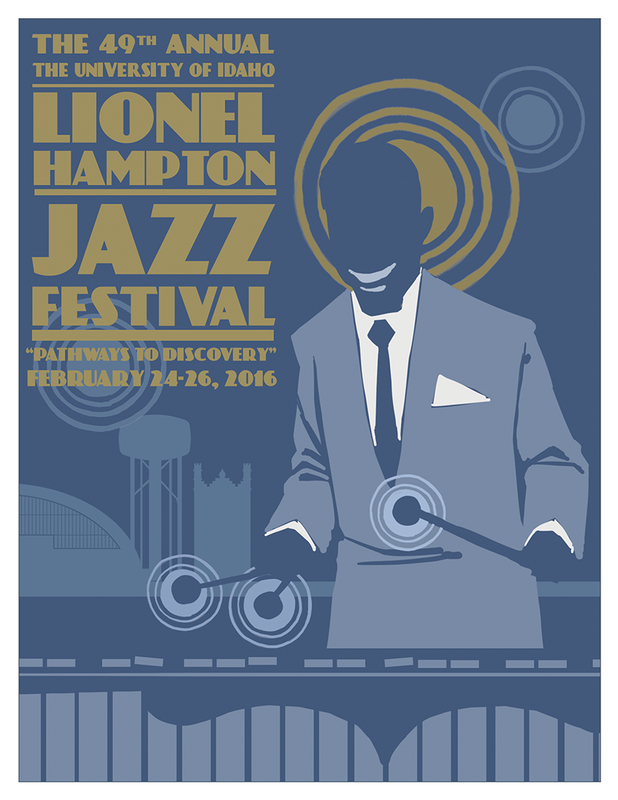 The silhouette in the middle is Lionel Hampton. I've never actually done a word design like this before, but I thought it was a neat idea and that it somehow captured some of the vibrancy of jazz. 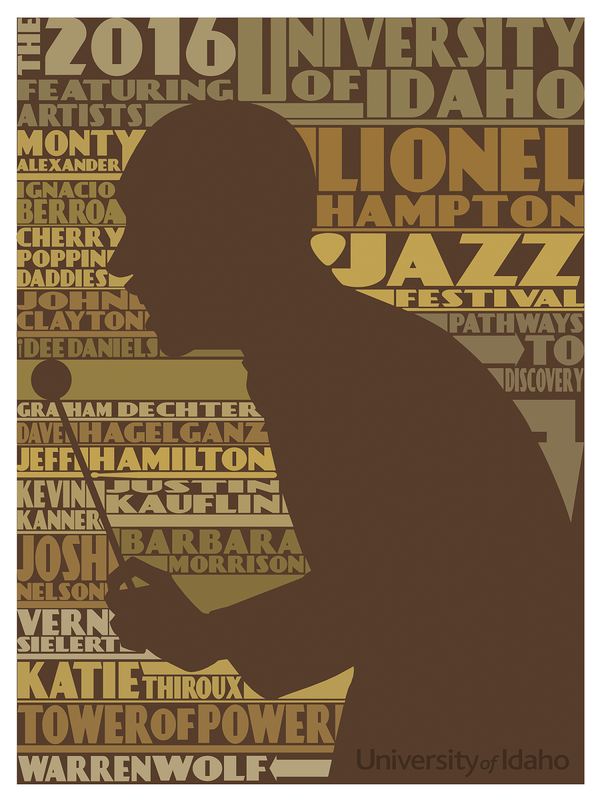 I said it earlier, but it's worth repeating: Being asked to create this year's festival poster was a genuine honor. I was glad to contribute in my own small way. Here's the most recent comic for Investing.com. This week's comic deals with recent negotiations between Russia, Saudi Arabia, and Iran over oil output levels. 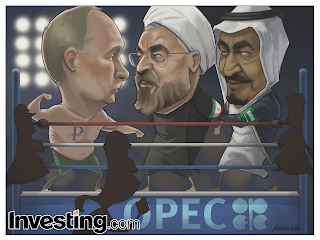 The crew at Investing.com asked me to draw a WWE-style wrestling ring. 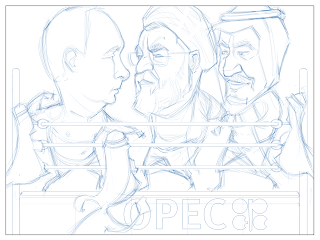 In it, they asked me to draw Saudi King Salman holding Iranian President Rouhani while President Vladimir Putin punches him. This is a metaphor for the pressure being brought to bear on Iran regarding their output levels. At least, I'm pretty sure it's a metaphor. 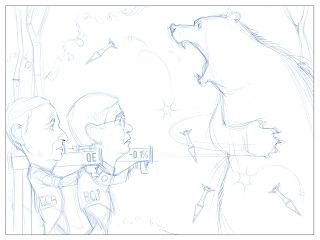 I'm just an illustrator, and as such, I'm rarely invited to attend OPEC meetings. 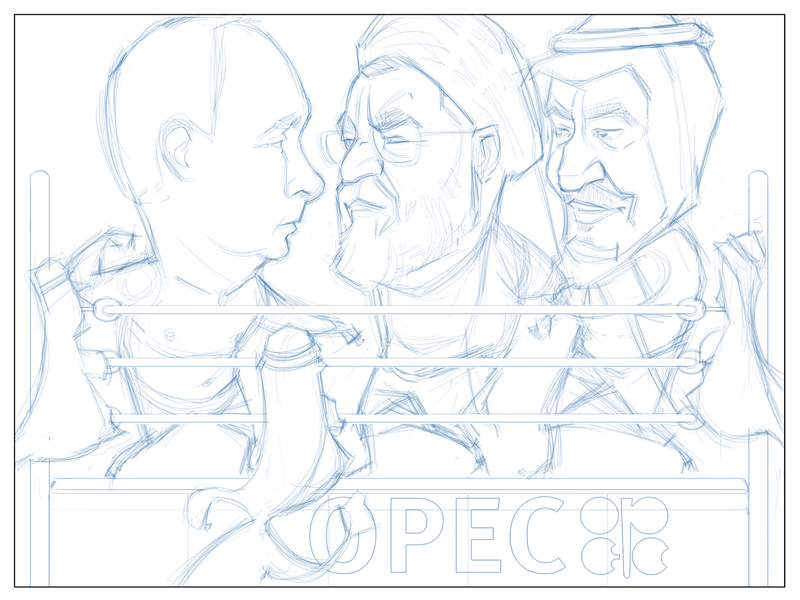 I was also asked to include some Sheikh-type characters cheering in the foreground. This comic was a beast. By which I mean a lotta work. Three caricatures plus setting plus people in the foreground, minimal though they may be. That's a lot to do in one day. It took about 11 hours. Overall, I think it came out well. I hadn't felt great about the last two comics. They weren't awful, but they weren't strong either. So I wanted to have a better showing this week. Candidly, I get paid the same amount whether or not the drawings are good. But I'm a very competitive person when it comes to my work. I'm always trying to improve, if only marginally. And it irks me when I work hard on a comic and it doesn't come out looking all that great. Not so great parts: This isn't a super strong composition; everything's just kind of crammed in. And the guys in the foreground are way too small. Being in the f.g., they should be larger. But that would also mean they would block more of the action behind them. It was a deliberate choice. On the Up Side: I think all three caricatures came out pretty well. And that's a big part of the battle. I also like the stadium lights behind Putin's head. I wasn't asked to add it, but I think it's a nice touch. Long story long, I think this is a solid comic. Here's the latest comic for Investing.com. This week's subject is Federal Reserve Chair Janet Yellen's semi-annual monetary policy testimony before Congress. 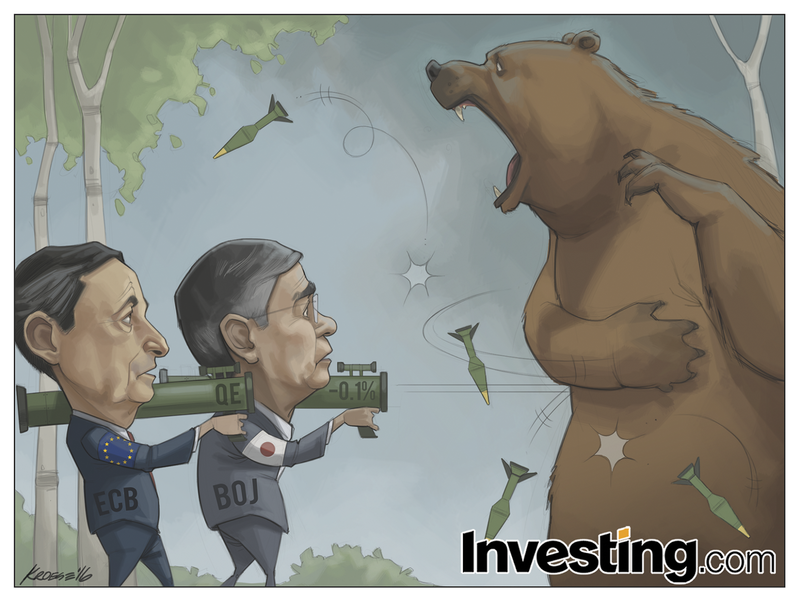 The issue at the heart of the comic is whether or not Yellen's testimony will sooth the markets, which have been turbulent of late. 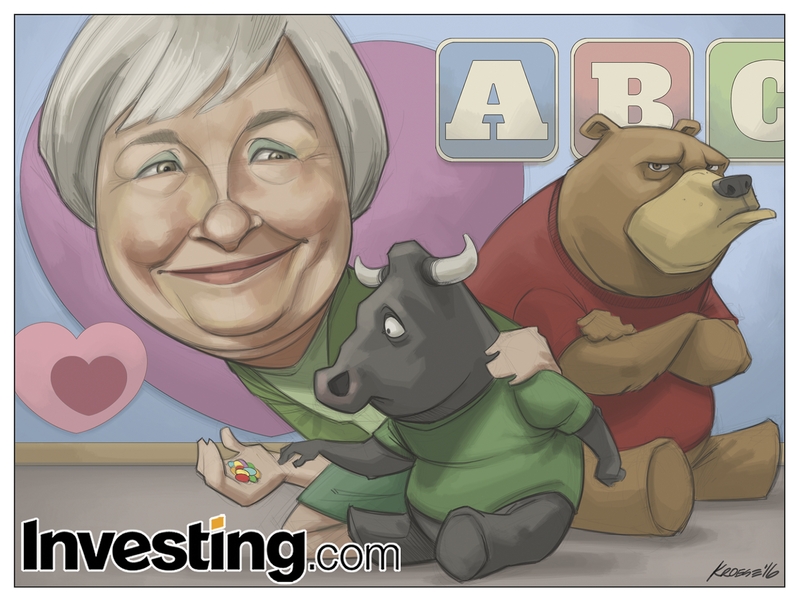 I was asked by the crew at Investing.com to draw a kindergarten/preschool classroom wherein Yellen is offering candy and being reassuring (patting it on the back) to a baby bull in a green t-shirt while a larger baby bear glowers in the background. Not too much to say about this one. 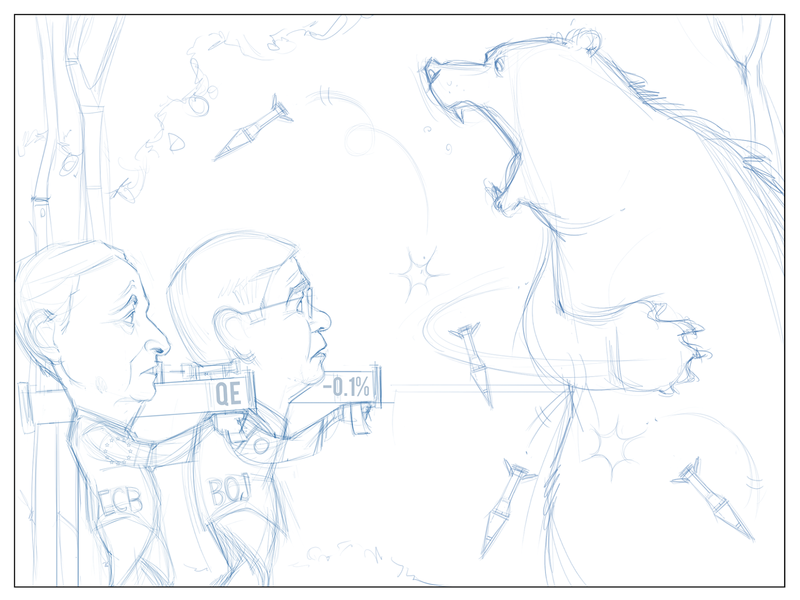 I sketched Yellen first, then drew the bear and the bull. 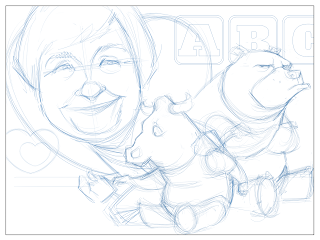 Then I circled back and re-drew Yellen because the original version was crummy. Sometimes it takes me a while to warm up. I also changed the color of the back wall from yellow to blue at the last minute. It seemed like the yellow was competing too much for foreground attention. The likeness of Yellen seems serviceable, but I don't think it's my best attempt. I also think the bear looks a little weird for some reason, but I couldn't figure out why. Maybe his face is oddly shaped or proportioned? If I could have figured out why he looked off, I would have changed it, but I could never put my finger on it. 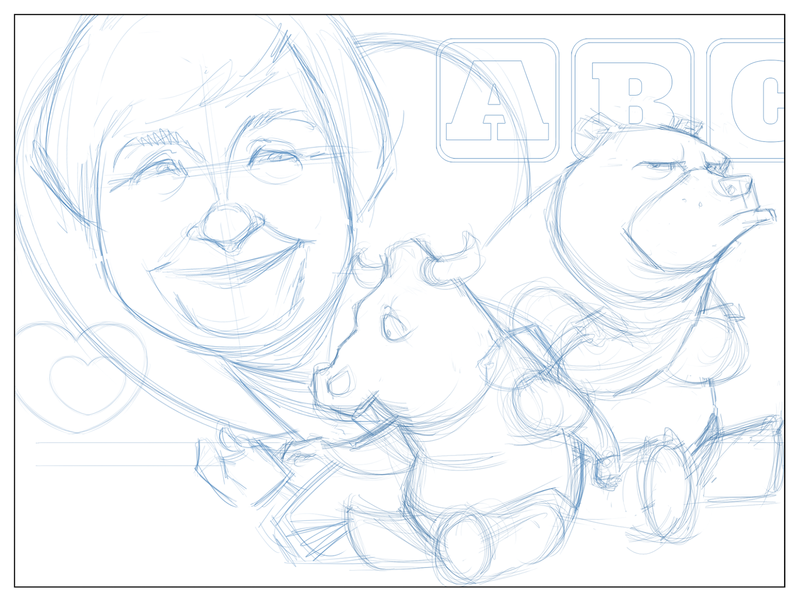 I've had SO much practice drawing both Yellen and bears. You'd think after all this time that it would be a cinch and that I could draw them without thinking or trying. Well, you might not think that, but I would. And I would, apparently, be wrong. Here's the latest comic for Investing.com. The subject this week (provided by the crew at Investing.com and drawn by yours truly) deals with the efficacy (or lack thereof) of recent quantitative easing measures on global markets.